Having previously interviewed some local businesses, that have been initially supported by The Prince's Trust, I have decided to branch out and look at other local (and maybe not local) folk, that are working hard in the world of self employment. 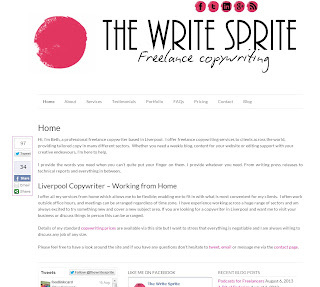 I’m Beth and I run The Write Sprite – a teeny tiny copywriting agency that consists of just me! I work from home in Liverpool although I am planning a move. 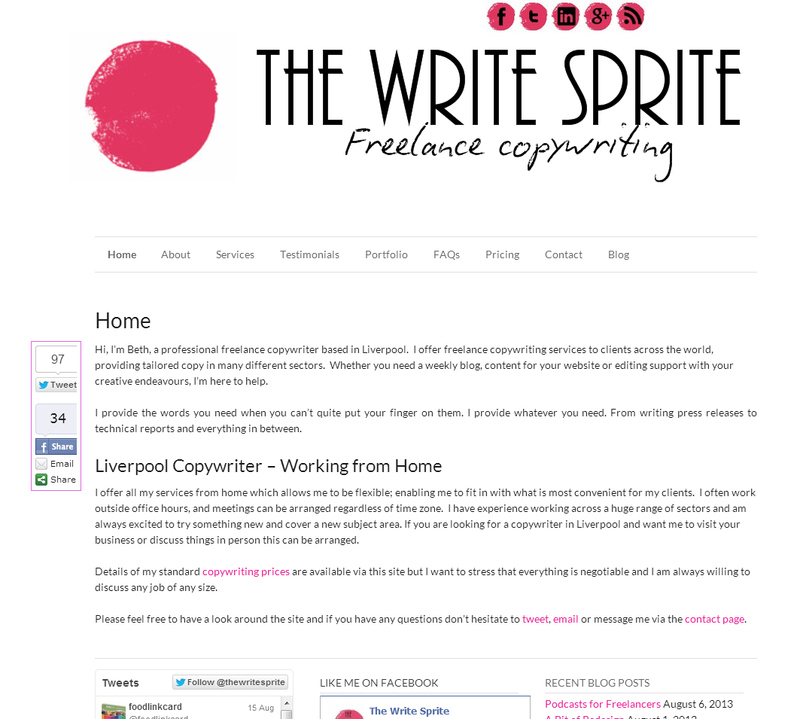 My website/promotion is all geared to being a Liverpool copywriter though so I may still consider Liverpool my workplace if I move. I have clients from all over the world so I don’t suppose my location is as important as some other people’s are. Best thing about working at home/being self employed? I am in control of my own time, to a point. If I want to say no, I can. If I was working for someone else and my boss told me to do something saying no would be much harder! Worst thing about working at home/being self employed? I am in control of my own time, to a point, and I never say no! I haven’t quite mastered time management yet – I’m always snowed under which is great for profits but no great for seeing my partner and children! Take it slowly and do your research. I would never have imagined when I started up that I’d need 30+ hours a week to do my job adequately. Think about what you want from self-employment too. I’d also say you need to be accountable to someone as without a boss there are times you’ll find motivation hard – find another self-employed person (or a small network) and check in with them regularly – it’ll give you a sense of having a colleague which really matters! Mine’s an awesome fellow Twitter fanatic who keeps me going! I love the simplicity of Beth's website, it still manages to look pretty, whilst being very easy to navigate. I also like the fact that Beth is very open and honest about her services and prices, which is refreshing. In regards to her words of wisdom, I am very much in agreement! Time management is something that I struggle with, as it is VERY hard to switch off when you are self employed. There is usually no leaving your work behind, as it is usually with you, wherever you go. So it takes time and discipline to truly switch off. I also agree with Beth in terms of looking for colleagues, just because you work alone, doesn't mean you have to isolate yourself. Before I moved to the studio, I relied heavily on my twitter and facebook peeps to keep me motivated during the witching hours. I think I will always look to the people that lurk in the social media world for motivation and inspiration, as we seem to be on the same wavelength. 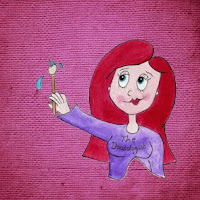 I am also loving the interaction with real life creative people too, so will be looking into other networking opportunities, something that I know Beth has been doing too. Thanks so much for answering my questions Beth!